*Birthday Parties - Our barn loft, courtyards, and creek side areas are great spaces to keep kids entertained all day. The Farm Hall has heat/air conditioning and is also an option for birthday parties and can be decorated to fit any style. We have a huge chalk board installed in our outdoor kid's area, and also have logs for the kids to climb on. *Girls Night In - Rent our cozy cottage for a girls night in, complete with a bonfire outside in the fire pit. Along with relaxation and nature, you'll definitely want to take a hike on the trails, through the fields, visit Rosewood Farms, and Wagon Wheel Treasures, both within 15 minutes of drive time from the farm. Oh, and Rosewood has amazing chocolate and coffee! Take a drive through the countryside while you're here too...it's so peaceful here! *Reunions - Our 3,000 sq ft, climate controlled Farm Hall is a great space for reunions. With every event, you have the option of using whatever space on our property you want because you have exclusive access. *Retreats* - Rent the whole venue, or just our cozy 3 bedroom, 1.5 bath cottage for a family or corporate retreat. Go hiking, exploring, and experience the countryside. We can recommend lots of great local places to visit and places to eat too! See a featured blog post about a family retreat at Hope Springs here! *Bonfire Party - Our fire pit is a perfect place to cozy up. Bring a few guitars, marshmallows, and the family, and you've got a perfect night in the country. The Fire pit is included with every event. ​*Corporate Events - Use our facilities for appreciation events, retreats, and/or meetings for a comfortable and spacious place to gather with no set up required. *Bridal Showers - Host a Bridal shower in the Farm Hall, while also utilizing our courtyards to add a little extra fun! 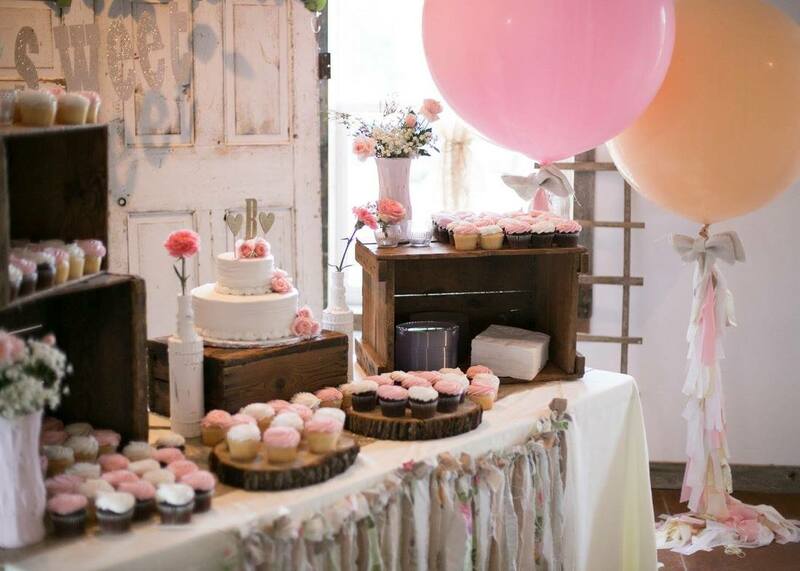 *Baby Showers - Host a baby shower in our Farm Hall or the barn loft to keep the kids entertained! *Holiday Parties - Not enough room at home for your growing family? Host your holiday party at Hope Springs for plenty of space, plus a 3 bedroom cottage for the out of town family members! Are you ready to take out ALL the stress of planning your event? Let us do it for you! Our vendors can plan the whole thing, including: food, décor set up, photography, Cakes, flowers & music! We even supply a detailed floor plan to help with planning. We also offer set up, coordinating, & sheer draping for an additional fee. Give us a call if you're interested, or be sure to visit our preferred vendor page for more info on our vendors! **These prices are for 100 guests or less. If you have more than 100 guests for your event, please call for a custom price quote. E-mail us to discuss or book your event!